Having missed the above advice of Orton Jobs, John sat slumped over his desk. He was concentrating hard on the senior partners’ teleconference. But at 2pm, the sugar from lunch was fast wearing off and he slowly lent back in his chair, keeping an eye on the Skype screen in front of him. “John! John?” The sound of his name pierced the fog surrounding his brain. As he jolted upright and came to, just in time to overhear a guttural snore from his own flipped back head, he realised, to his horror, he’d actually dozed off mid-meeting. “John, do you think we should restructure accounts?” someone asked from the computer. “Oh, ummm, errrr”, John stalled. “I think we need a review, some independent work carried out” he faked. Sound familiar? We have created workplaces, and more specifically corporate workspaces, that are sending us to sleep. Far from enabling peak performance, our current workplaces are very often designed to support low human performance. Science knows that constant sitting is bad for us, alarmingly bad actually. Yet business tends to confine us to sedentary jobs, while still expecting the best of us. Humans just aren’t designed to sit; movement is fundamental to the human condition. Moving as part of our day-to-day activities is part of our evolutionary heritage; we evolved to operate in an unstable, outdoor environment, in more or less constant motion. While our daily environment has changed beyond all recognition, you and I still have the exact same genes that benefit from constant motion. Sadly, the modern office provides the exact opposite of the environment we are designed to thrive in. Science knows one thing, business and convention does the opposite. I’m not advocating we revert to the brutish lifestyle of the caveman. Of course not. But is there a way we can more closely model our office and work environment to mimic what our genes demand and respond to, boosting our vitality and enabling us to thrive at work? I’m talking about getting off you a…. for at least part of the day. I call this the GOYA principle. Here’s my desk at the university – standing height – my stool is a “mogo” which is inspired from the seat of a Massey Fergusson tractor! In my world of research and practice in helping people be the best they can be, I’ve introduced the standing desk and the uncomfortable (anti-ergonomic) stool. The problem is simple and, fortunately, so is the solution. Problem: At work we spend much of our day sitting. The more you sit, especially unbroken sitting, the more likely you are to be overweight, depressed, and suffer a whole bunch of other negative health problems from low back pain, to over use syndromes. This research isn’t even new, although the exact physiology is now much better understood. Professor Jerry Morris initially carried out research in this field in the 1950s when he noticed London bus drivers had twice the rate of heart attacks than the bus conductors. For the next 50 years, that simple fact was known yet we continued to only promote the ‘more exercise’ message. In that time humans have sat more and more and more – at home and at work. Despite inventing a whole new discipline to enable us to sit “safely” for long periods of time at work (ergonomics), all the evidence indicates sitting is bad for health. Very recent studies now show that even regular exercise may not remove the potential negative effects of long periods of being sedentary, by which we mean all the sitting time at work, reading, travelling, computer time and television viewing. Avoiding long periods of sitting is good for our health, helps us concentrate better, and improves our well-being. So how can we create a working environment where we sit less, stand more, and are motivated to GOYA throughout the day? AUT’s Human Potential Centre worked with AUT’s School of Design and Creative Technologies to make our own standing GOYA environment. Using design thinking, and rapid prototyping principles, we created a range of office furniture that is mobile, interchangeable and adjustable to suit our needs. Our height-adjustable desks feature sufficient room for a computer, standing meeting tables, boxes, coffee tables and storage units. Our proudest design achievement, and most powerful piece of furniture, is what I call the “anti-ergonomic chair”. It’s just not that comfortable, for which we love it. Having installed these in our offices at the Human Potential Centre we found that sitting on them for more than 10 minutes made our bums sore enough to prompt us to GOYA. Job done! Our trials using “Sit-to-Stand” desks in other workplaces have shown similarly encouraging results. We’re seeing increased mood and vigour, more standing (about an extra 2 ½ hours a day), reduced back pain and overuse injuries. In some cases, the standing desks and un-ergo chairs have proved so popular people have been hiding them so we wouldn’t pick them up at the end of the trial. Even regular exercise may not remove the potential negative effects of long periods of sitting. A recent study conducted by Vitality Works reported a range of beneficial outcomes from using Sit-to-Stand desks for both employers and staff members’ perspectives. A significant reduction in absenteeism and the rate of early report incidents for Discomfort, Pain, or Injury (DPI) was recorded. Staff members also reported increased levels of focus, concentration, and energy, and improved feelings of authority and confidence. 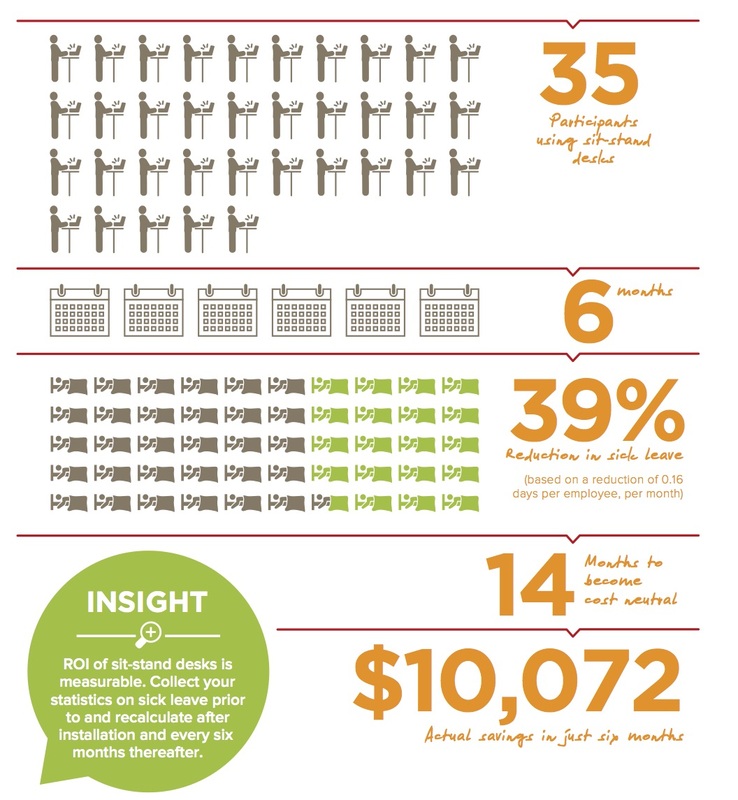 Based on reduced absenteeism, it has been estimated that the standing workstations will be cost-neutral after a period of 14 months. The options, when looking to transition to a workplace promoting movement (and standing as the default working position), will vary from place to place. How you plan to make the transition and how long this transition will take depends on several factors including the size of the organisation, budget, furniture contracts, and health and safety policy. Put a coffee table on top of your regular desk. Pros: simple, cheap or free. Cons: a lack of flexibility and desk space (there is often not enough room for a screen, mouse, paper and other stuff); heights can be hit and miss, either too short or too tall. Build a big box. Pros: Cheap, requires minimal building skill, can be tailored to your requirements. Cons: It may be ugly, and flexibility is limited. Buy an electronic height adjustable desk. Pros: It’s the real deal and you can go up and down accordingly. Cons: Can be costly, and it’s easy for you get lazy leaving it in the sit position. Build a new desk from two old ones. 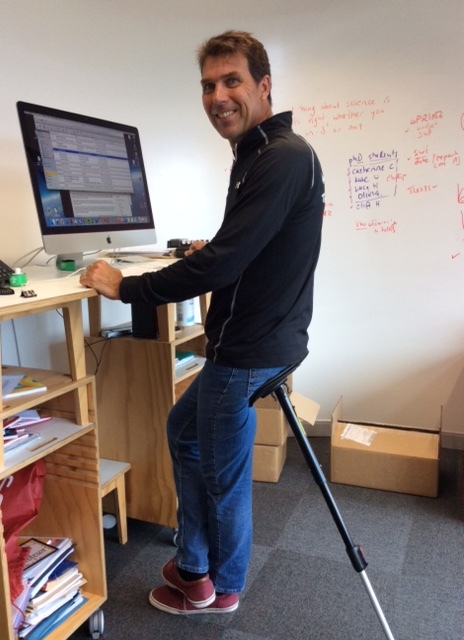 This was the ingenious solution from the guys at Vitality Works. They took a bunch of old desks and plonked a cut down one on top of the old one, making each one suitable for the person it is designed for. Pros: Looks very cool and takes advantage of recycling old desks, creates a standing-centric environment balanced by the occasional use of stools. Cons: You have to have actual building experience. Build a new furniture system yourself. This was our solution at the Human Potential Centre. We have custom designed and adjustable standing-centric furniture. Pros: Way cool, and adjustable and versatile. Cons: Cost heaps. Encourage staff to pace during mobile phone calls. Above all, disseminate the simple message “move more, sit less GOYA”. ← Big fat debate in NZ 2/2 – what does the evidence say? Cheap option: boxes and books. Great to see this article and research Grant. 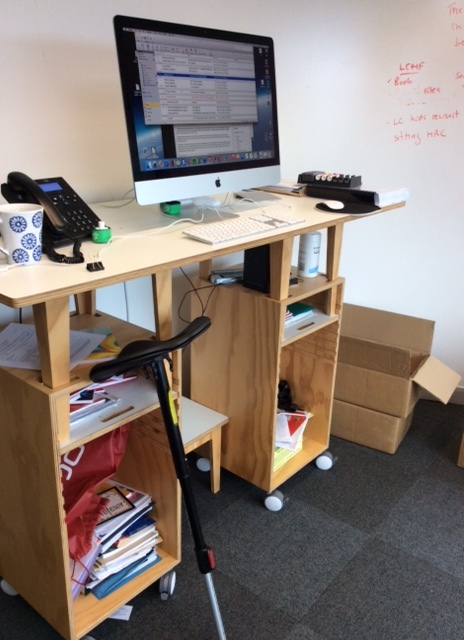 And as you know I am now happily with standing desk myself and already experiencing the benefits. I’ve got a Mogo in the mail! Thanks!! !